I went to work as normal this day, I hadn’t had my morning Xanax, but thought, I’ll just get it when I get to work. Around mid afternoon I couldn’t get off the chair, my brain was shutting down, I thought I had a really bad virus. I managed to get home and to the chemist for my prescription, swallow, 20 minutes later, no symptoms at all, debilitating sickness magically gone, I knew there was a problem. I did my research, found my internet groups, the Ashton manual, and a local drug and alcohol support group. 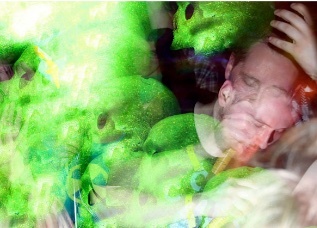 … but nothing compared to the sickness I felt when I took my last pill. The first onset of benzo withdrawal symptoms from shorter-lasting forms of the drug like Xanax (Alprazolam) typically occur within hours after ending use. 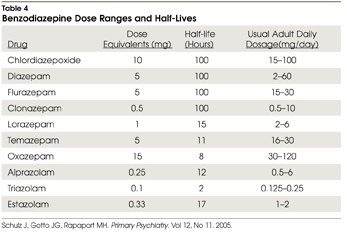 For longer-lasting benzos like Valium, it can take quite a bit longer to feel the effects (see chart). Withdrawal from long-term use of any benzodiazepine can be an awful thing to experience. As Adrian described above, you may feel like half the person you were while using the drug, and the effects may last for months. While death and permanent damage are uncommon for people who use only benzodiazepines, those who abuse benzos with alcohol and other prescription drugs are risking their lives. A person withdrawing from the drug can become seriously depressed and detached from others, which can lead to suicide. This is why it is important to have a support network in place before attempting to quit. If you feel you are in over your head, before you quit taking Xanax, Valium or Ativan, speak with a doctor about weaning yourself off of the drug. Speaking to a doctor is especially important if you’ve been using for many years, or if you’ve been using benzos along with opioids and/or alcohol. While it is tough to make it through withdrawals, it is absolutely necessary in order to be free of your addiction, long term. Believe me, those bad feelings and thoughts will eventually pass, and your old self will return. When you are experiencing withdrawal symptoms, try to keep in mind that it is only temporary. Taking another pill or a snort will only delay the inevitable. The faster you get through it, the closer you will be to quitting for good. With professional treatment and a good support system in place, you will be able to get through withdrawal, and you will be a much stronger person afterwards.